Americans need credible nutrition advice they can trust, not a choice between quacks and “experts” sold out to junk food companies. OK. Him and everyone else. I told him I was glad he found an expert who could help him. A week later I saw him again. “I went back to the nutritionist,” he said. “I can’t have nightshades either.” That means no more potatoes, tomatoes, chili peppers, or eggplant. The next time I saw him, he’d given up dairy, corn, black pepper, and sweet potatoes. I’m not really sure what exactly he is eating at this point, besides cabbage. He’s also taking a long list of supplements, all on this new nutritionist’s orders. I suspected that this “nutritionist” has no license of any sort. She’s certainly not a registered dietitian. I finally asked him how she tested him for allergies. She had him hold a glass vial of a particular food in one hand and, with the other hand, hold his thumb to the tip of his middle finger. Then she tried to pull his finger and thumb apart. If she could, then she proclaimed him allergic to whichever food was in the vial he was touching. I’m not the confrontational sort. I kept a straight face and wished him luck with his diet. Searching the Internet, I quickly discovered this bogus method of “allergy testing” is actually quite widespread. Practitioners call it “applied kinesiology.” And, no, it doesn’t work— unless it provides some sort of placebo effect. Why are people falling for this? Funny you should ask. The answer might lie in another disturbing trend. The very same week of my acquaintance’s revelations about his numerous food allergies, Mother Jones published a hilarious yet sad account of McDonald’s catering the annual conference of the California Dietetic Association. That’s right. Mainstream registered dietitians attended a conference sponsored and catered by McDonald’s to earn continuing education credits to maintain their certification. There, they listened to Walmart people claim that Walmart helps keep communities healthy. The Corn Refiners Association, the high fructose corn syrup industry’s lobby group, argued that high fructose corn syrup is just fine to serve kids in school lunches. With the mainstream nutrition community under so much pressure from Big Food is it any wonder why people are looking for alternatives and vulnerable to flaky fads? And who is worse off? The person who seeks help from a dietitian who takes nutrition advice from the corn syrup lobby or the one getting assistance from a quack who believes she can detect allergies using the “Pull My Finger” method. Even some registered dietitians who belong to the corporate-sponsored Academy of Nutrition and Dietetics (formerly known as the American Dietetic Association) are fantastic sources of nutritional advice.One registered dietitian told me she left the Academy of Nutrition and Dietetics after it sold her contact information to McDonald’s. But others prefer to stay in the organization and work for reform from within. Melinda Hemmelgarn is one such dietitian. On her blog and radio show, both named Food Sleuth, she interviews experts on every aspect of food, agriculture, and nutrition. We need conscientious, honest experts like her influencing our national nutrition policy and health recommendations. And our registered dietitians don’t need any “education” from the fast food and junk food industries. After all, if mainstream dietitians didn’t have to put up with that kind of pressure, fewer people would fall prey to quacks who want to pull their fingers. 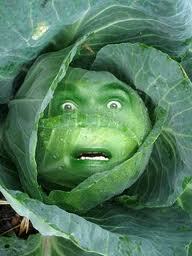 That face in the cabbage is the governator, isn’t it? It’s an old picture but Herr Gropenfuhrer’s surprised expression and underbite are very recognizable.